Today I have another secret recipe for all you cheese lovers out there. As if regular cheesy bread isn’t enough, this crusty bread is stuffed and topped with three types of cheeses and seasoning to create this yummy dish. What I love about making this recipe at home is that I can get creative by using different combinations of cheeses and other fillings like bacon or pepperoni. Make the dough: Whisk the sugar and 3/4 cup warm water (about 105 degrees F) in a bowl. Sprinkle the yeast on top and set aside until foamy, about 10 minutes. Stir in the vegetable oil. Whisk the flour and salt in a large bowl. Make a well in the center, pour in the yeast mixture and stir with a wooden spoon to make a shaggy dough. Turn out onto a generously floured surface and knead until smooth and elastic, about 5 minutes, dusting with more flour as needed. Form into a ball. Brush a large bowl with vegetable oil; add the dough, turning to coat with the oil. Cover tightly with plastic wrap and set aside at room temperature until doubled in size, about 1 hour, 30 minutes. Make the filling and topping: Toss 1/2 cup mozzarella, the cheddar, pecorino, garlic salt, granulated garlic and dried parsley in a bowl. Preheat the oven to 450 degrees F. Put an inverted baking sheet in the oven; preheat for 10 minutes. Line another inverted baking sheet with parchment paper and sprinkle with the cornmeal. Cut the dough in half; transfer 1 piece to the parchment-lined baking sheet and stretch into an 8-inch square (keep the other piece of dough covered). Sprinkle 1 side of the square with 1/2 cup of the remaining mozzarella, then fold the dough in half to enclose the cheese, pressing to seal. Slice the dough crosswise at 1-inch intervals, stopping just before the folded edge. Sprinkle with half of the cheese-garlic mixture. Move the dough to 1 side of the baking sheet. Repeat with the remaining dough, mozzarella and cheese-garlic mixture on the other side of the baking sheet. Slide the bread on the parchment onto the hot baking sheet in the oven. 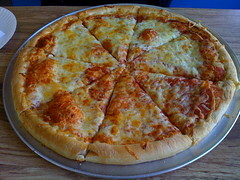 Bake until the dough is cooked through and the cheese is golden brown, 12 to 14 minutes. Let cool slightly, then pull apart into breadsticks. Today’s secret recipe is for a fun sweet treat that everyone will love. Domino’s now offers Cinnastix which are yummy oven baked cinnamon-sugar bread sticks with a warm ooey gooey vanilla icing to dip them in. This recipe is incredibly easy to prepare with the use of pre-made pizza dough. Now you have no reason not to enjoy a home baked dessert. Preheat oven to 350 degrees F. Roll out pizza dough to a rectangle, roughly 10 by 12 inches, cut in half across the longest side, and then cut the other sides into 8th’s. You should have 16 individual pieces now. Place pieces onto a lightly greased baking sheet, and bake for approximately 15 minutes. While the sticks are baking, make the icing by combining the powdered sugar, vanilla, milk, and 1 tablespoon of butter. You may need to add additional milk to thin down the icing. Set icing aside. Combine the 1/2 cup sugar and 2 teaspoons cinnamon in a bowl, mix well. Melt the 1/4 cup butter and when the pizza dough is done brush with butter. Sprinkle over the cinnamon and sugar mixture over the freshly buttered sticks. If you are a cheese lover like me, then today’s secret recipe is for you. As if a regular cheese pizza isn’t cheesy enough, Domino’s created the Wisconsin 6 cheese pizza which is topped with mozzarella, feta, provolone, Cheddar, Parmesan and asiago cheeses. If that wasn’t already an overload of cheese for your palate, the base of this pizza is a Parmesan asiago crust. Mix together the yeast, sugar, oil and water in a large bowl. Let rest until foamy. Add half the flour and all of the salt. Use your hands to incorporate the ingredients until well blended. Add the cheeses and another 1/2 cup of the flour. Incorporate these into the mixture. Set the dough onto a floured area and knead for about five minutes. Coat a large bowl with oil. Set dough in bowl, cover and let rise for about 1 1/2 hours, or until the dough ball has grown twice as large. Place the dough onto a floured area and work into a 14-inch round. Top with sauce and then the cheeses. Finish up with a dusting of the oregano. Place on bottom rack for about 10 minutes or until done. Save An Extra 15% on Already Low Priced Ink Cartridges! Today’s secret recipe will show you how to recreate the yummy cheesy bread from Domino’s Pizza. Copious amounts of four different cheeses make these bread sticks absolutely delicious. You can prepare your own dipping sauces for the cheesy bread with these recipes for Domino’s pizza sauce and Papa John’s garlic sauce from our forum. Your family will go nuts over this bread and it is always a hit at parties. You might want to double this recipe because everyone loves this super cheesy bread. Preheat oven according to french bread package. Combine oil, garlic salt and garlic powder, brush over the bread. Sprinkle corn meal on top of the bread and then flip over. Parmesan, parsley, and remaining butter. Bake bread according to the package until cheese is melted and bubbly. Allow cheese to set for a minute. Cut bread width-wise into 1 inch slices. Serve healthy, home-cooked meals that can be cooked in a flash.